Whole Grain Pumpkin Muffins – This is an old faithful recipe for sweet and super moist pumpkin muffins. This recipe is so easy that my lil munchkin and her buddy made them with me. We got so caught up in the fun of making these that I forgot to snap a pic…oh snap! Spiced Lentil Soup with Roasted Beets and Winter Squash – I took a few liberties with this recipe and threw in some roasted turnips (because I had them) and omitted the cardamom (because I didn’t have any). The result – layers of delicious flavors. We happily ate on these leftovers for several days. 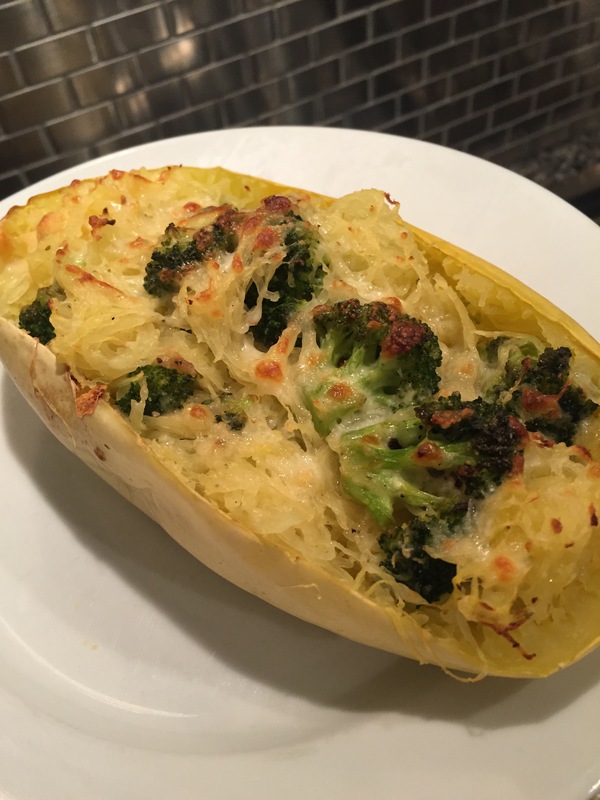 Broccoli and Cheese Baked Spaghetti Squash – I don’t know about you, but I’m always looking for new ways to use spaghetti squash. 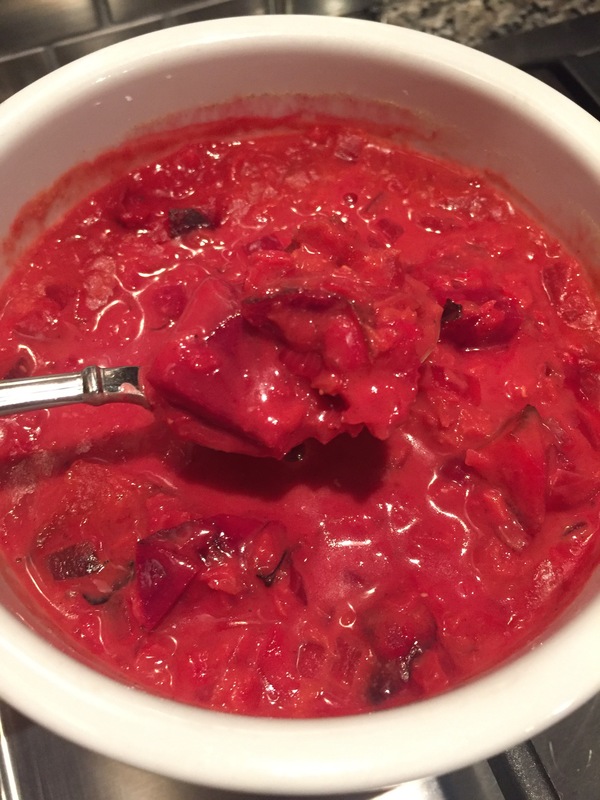 This recipe is pleasantly easy and pleasing. I’ll likely up the garlic ante next go round and substitute Gouda for mozzarella. You can never go wrong with garlic or Gouda in my book. 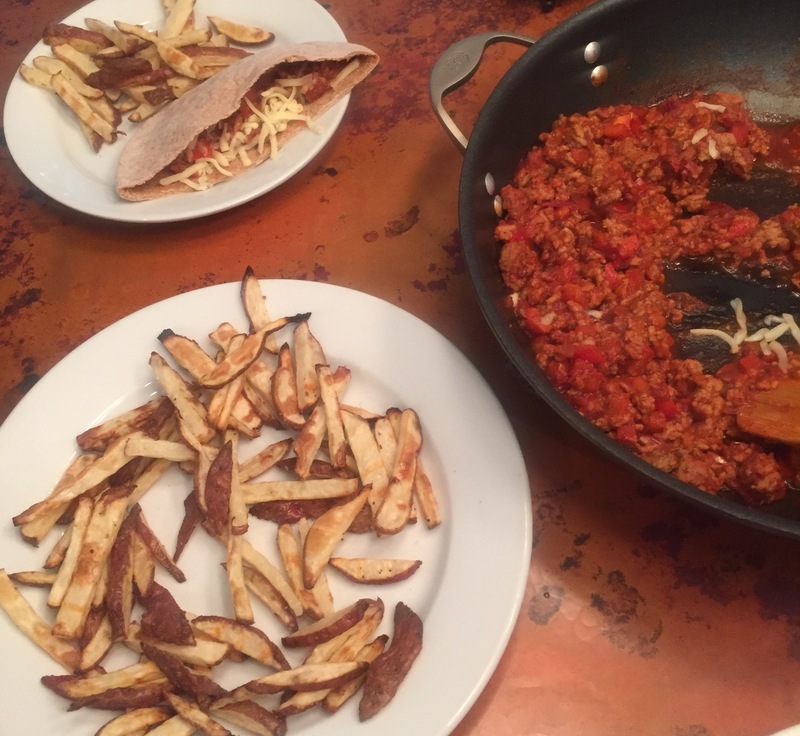 Clean Eating Sloppy Joe’s with Crispy Baked Fries – You’ve seen this recipe here before because it’s crowd pleasing staple. Enough said. Slow Cooker Quinoa White Bean& Kale Soup – I had intended to prepare this recipe, but I just didn’t get around to it. I feel certain you’ll a version of it here soon. Directions: Preheat oven to 350 degrees. In a small bowl, stir together the dry ingredients (flour, pumpkin spice, baking soda, baking powder, and salt). In a larger bowl, whisk together the wet ingredients (eggs, honey, vanilla, butter, and pumpkin). Add the dry ingredients to the wet and stir just until combined (do NOT over stir). Spray muffin tins with a nonstick oil (I like to use a mister filled with olive oil). Fill 2/3 full and bake for 15-18 min. Directions: Preheat oven to 400 degrees (bake, NOT convection). Loosely wrap the beets and turnips in foil. Line a baking sheet with foil or parchment paper. In a small bowl, toss the squash with ½ t. olive oil. Arrange the squash on the baking sheet in a single layer. The beets/turnips and squash all go in the oven. After 15 minutes, flip the squash with a spatula and flip the foil wrapping containing the beets/turnips. Return to the oven to continue roasting. After 15 minutes, remove the squash and set aside. After an additional 15 minutes, check the beets/turnips for doneness. They are done when easily pierced with a fork. Note: They may require up to another 15 minutes. Carefully unwrap and allow to cool before dicing into cubes. While the beets/turnips roast, heat a large stock pot to medium heat. Add the coconut oil and onions. Cook until the onions are translucent. Add the garlic and the following spices: turmeric, curry powder, ginger, cardamom, cinnamon, and black pepper. Cook until the onions begin to brown (about 5 minutes). Add the broth and lentils and bring to a boil. Immediately reduce heat and simmer for 15 minutes. Remove from the heat. Stir in the beets, turnips, coconut milk, thyme, salt and lime juice. Serve immediately. Tip: To easily remove tough winter squash skin, microwave the whole squash for one minute. Then, use a sharp knife to slice off the skin. Directions: Preheat oven to 375. In an oven safe, nonstick skillet, warm the olive oil on medium heat. Brown the chicken sausage for about 5 minutes. In the meantime, in a small bowl whisk the eggs. Add cheese to the eggs, stir, and set aside. Add onions and salt/pepper (to taste) to the skillet. Cook for 3-4 minutes or until the onions are translucent. Add the Swiss chard to the skillet, stirring often. Continue cooking until the greens are softened. Add the garlic, cooking until fragrant (about a minute). Pour the cheese/egg mixture evenly atop the skillet. Allow the eggs cook until the edges begin to firm up. Place the skillet in the oven for about 10-15 minutes to finish cooking. The frittata is done when then eggs in the middle of the skillet have become firm and the cheese is beginning to brown. Carefully remove from the oven. Allow to sit for a 3-4 minutes to further firm up. 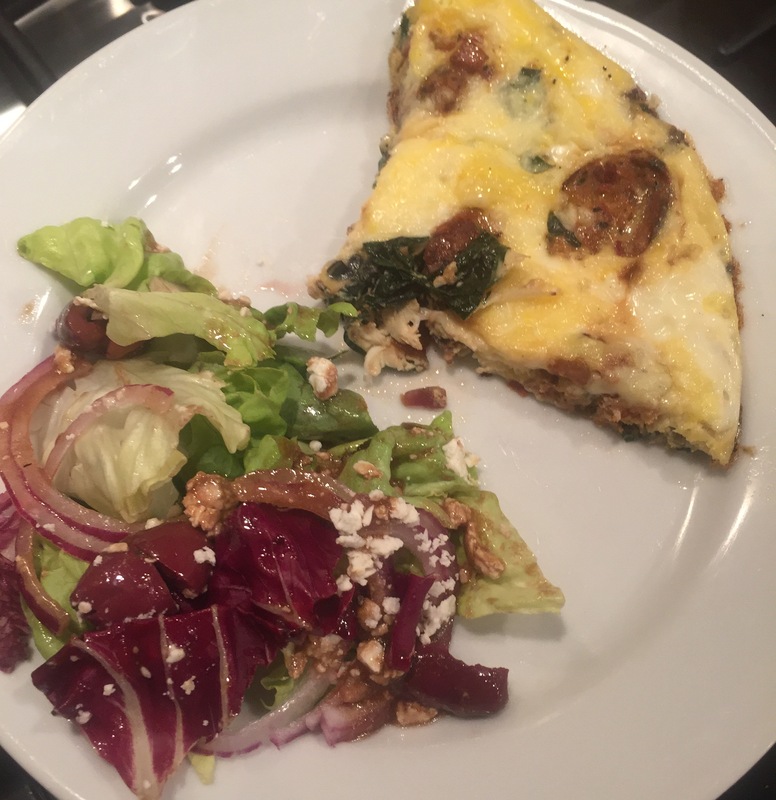 Serve in “pizza style” slices from the skillet OR ensure the frittata is loose by running a nonstick spatula around the edges of the frittata and invert the skillet on a plate. Enjoy as is or with top with salsa and/or hot sauce. Directions: In a small sauce pan, add the balsamic vinegar and stevia. Bring to a boil and immediately reduce to a simmer until it has reduced by one-half (about 30 minutes), stirring occasionally. It’s ready when it is thick enough to coat a wooden spoon. *These three ingredients can be replaced with Worcestershire sauce. Fudgy Chocolate Beet Brownies – You’d never know the beets are in these brownies. They are chewy and fudgy – simply delicious. (Pictures slipped my mind – oops). Quinoa Potato Salad with Pan Seared Chicken – A great alternative to a traditional potato salad with mayo that does not stay fresh long or hold up well at a hot picnic. This one only gets better with time, and it matters not if it’s hot, cold, or somewhere in between. Grilled Chicken and Peach Arugula Salad – I wish I had doubled this recipe. It was gone in a flash! No time to pan sear chicken or the peaches? No worries. Omit the chicken and serve the peaches freshly sliced. It’s still gonna be fab! Spinach and Rice (or Quinoa) Stuffed Bell Pepper – I realized late in the game that Old Mother Hubbard’s cupboard was without rice. So, I substituted quinoa and it worked like a charm. I’ve never met a bell pepper that didn’t love Gouda and bacon!